Open Photo Booth on your Mac by clicking its name in the Applications folder, clicking its dock icon, or clicking its Launchpad icon. You can snap an image right away merely by clicking the oblong red shutter button below the large video screen that serves as a viewfinder. When you do so, a three-two-one countdown ticks off. On zero, the display flashes, and your portrait is captured. It’s a snap: the main Photo Booth view. If you click the leftmost icon and then click the shutter button, Photo Booth takes four successive snapshots in a row, right after the three-two-one countdown. 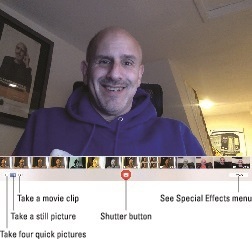 The just-captured images appear in a single “four-up” snapshot, showing your four poses. You’ve activated burst mode. Clicking (or dialing) the icon in the middle sticks with the one-shot approach, following the same three-two-one countdown. Making use of the icon on the right puts Photo Booth in video mode. After the countdown, the computer starts making a little video, complete with audio. You have to click the shutter button again (now a stop button) to cease recording. A red digital counter reminds you that you’re still shooting. You can remove any of the still images or videos you’ve captured in Photo Booth by clicking a thumbnail of those images and clicking the circled X that appears on the upper-left corner of the thumbnail.